Mythology: In Greek mythology, Orion was a great hunter. The goddess of both the moon and hunting named Diana fell in love with Orion. Diana was so enamored by Orion that she began to neglect her duty of driving the moon chariot across the sky to light it up. She spent all her time on Earth hunting with Orion. When her brother Apollo heard of this, he decided to do away with Orion. One day while Orion was swimming, Apollo shined his golden rays so brightly that Orion could not see where he was swimming. Orion started swimming away further and further away from the shore. Soon he only appeared as a faint dot in the waves. Apollo then challenged Diana to hit the tiny target with her bow an arrow. Diana, not knowing the target was Orion, show so accurately that she killed him. When she found his body on the shore that evening, she realized what had happened. After trying in vain to bring Orion back to life, she put his body on her moon chariot and drove high across the sky where it was darkest. She put the body of her beloved Orion in the sky and suddenly the sky became bright with stars that outlined his body, belt, and sword. To keep him company, Diana placed his two favorite hunting dogs, Procyon and Sirius, at his foot. Sirius is the brightest star in the constellation Canis Major (see February) and Procyon is the brightest star in Canis Minor (see March). For another version of the mythology of Orion, see July. Other: Sirius is the brightest star in the night sky. 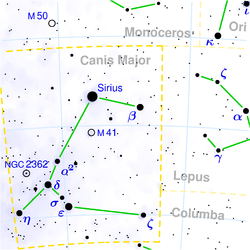 Mythology: Canis Major is the largest of the hunting dogs that had been Orion’s faithful companions on Earth. For Orion, see January. The Big Dog is named Sirius which is the name of the brightest star in the constellation. The star Sirius is also the brightest in the night sky. The other dog is the constellation Canis Minor (see March). 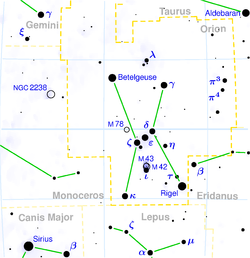 Other: Stars Procyon, Sirius, and Betelgeuse make up the Winter Triangle. 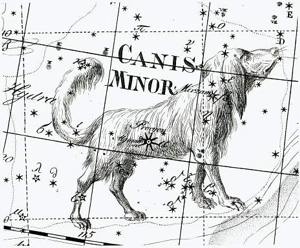 Mythology: Canis Minor is the second and smaller of the two hunting dogs placed in the sky to keep Orion company. For Orion, see January. 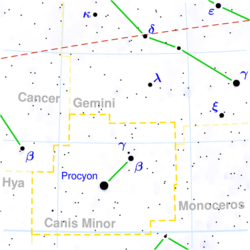 The Little Dog is named Procyon which is the name of the brightest star in that constellation. The other dog is in the constellation Canis Major (see February). Other: Spring comes in with Leo rising. Mythology: The goddess Hera, determined to make trouble for Hercules, made him lose his mind. In a confused and angry state, Hercules killed his own wife and children. When he awakened from his "temporary insanity," Hercules was shocked and upset by what he'd done. He prayed to the god Apollo for guidance, and the god's oracle told him he would have to serve Eurystheus, the king of Tiryns and Mycenae, for twelve years, in punishment for the murders. As part of his sentence, Hercules had to perform twelve Labors, feats so difficult that they seemed impossible. By the end of these Labors, Hercules was, without a doubt, Greece's greatest hero. Hercules’ first labor was to kill the Nemean lion, a fierce beast that descended to Earth from the Moon in the form of a meteor and ravaged the countryside of Corinth. The lion had a hide so tough that neither spear nor arrow nor any other weapon could pierce it. So well known was the beast that Hercules had no trouble finding its lair, a cave with two entrances. When Hercules entered the cave and found the lion he shot an arrow toward its heart but the arrow merely bounced off and fell to the ground. Hercules realized that arrows or spears were useless against the beast. So he sealed off one of the entrances to the cave to trap the lion. Using his great strength, Hercules seized the lion and strangled it to death. He skinned the lion using the lion’s claws and used the tough hide as a protective shield for the 11 labors. The majestic head and mane of Leo are formed by the curving ling of stars known as the Sickle, which look like a backwards question mark. 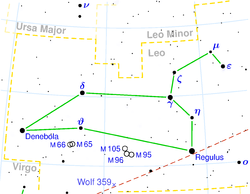 Leo’s main star, Regulus, is the brightest star in the constellation and is often referred to as the lion’s heart. Mythology: Virgo is known as the maiden or virgin. In Greek mythology, the constellation represented the goddess of harvest named Demeter. Spica, the brightest star in the constellation, represented an ear of wheat that Demeter held in her hand. According to Roman mythology, Virgo represented the goddess of justice named Astraea. The maiden was illustrated as carrying a balance or scales which is the nearby constellation Libra (see June). 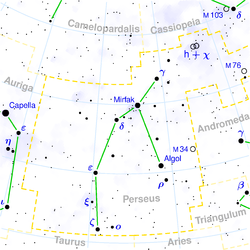 Virgo is the only female figure among the zodiac constellations. 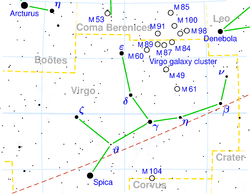 The 13 zodiac constellations appear along the ecliptic (red dashed line in image above). The ecliptic is the apparent path of the Sun. As we travel in orbit around the Sun on Earth, the Sun appears to move against the background of stars. 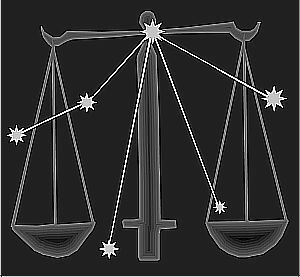 Mythology: The name 'Libra' means weighing scales or balance. In Greek mythology, it is associated with the goddess of justice and Virgo (see May). Libra is the only zodiac constellation that is not an animal or human. 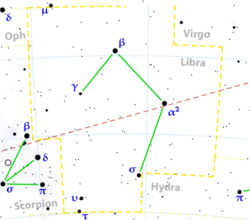 The four faint stars of Libra look like a flying kite between Virgo and Scorpius (see July). 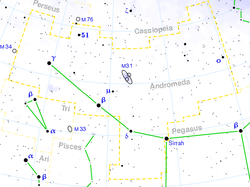 Mythology: More than any other constellation, Scorpius resembles it's given name - a Scorpion. The bright red supergiant star Antares marks the heart of the insect, and it's long curving tail trails to the south. The scorpion holds an infamous place in Greek mythology as the slayer of Orion. One story tells that Orion fled the scorpion by swimming to the island of Delos. Apollo, seeking to punish his sister Diana, challenged her hunting skills. Apollo dared Diana to shoot the black dot in the water. Diana won the challenge, but unknowingly killed Orion by doing so. Another story describes Orion as a great and boastful hunter who wanted to kill all the earth's creatures. The earth goddess Gaia was not please with Orion's intention so she sent a giant scorpion to kill Orion. No matter how are he tried, Orion could not defeat the scorpion. When he tried to escape, the scorpion stung him to death with its poisonous tail. Gaia placed Scorpius and Orion on opposite ends of the nighttime sky (see January for Orion). Mythology: Sagittarius was a centaur in Greek mythology. A centaur is half human and half horse. Most centaurs were rude, untrustworthy, cheating, violent, and aggressive. Sagittarius was a fierce hunter with his bow and arrow always poin ted towards Scorpius (see July). 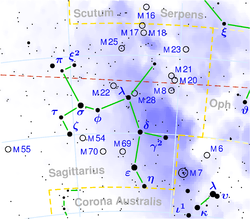 While Sagittarius is a large constellation, its stars are relatively faint. Most people recognize the pattern as a teapot with a lid, handle, and spout. Looking into Sagittarius, you are looking directly at the center of our Galaxy through its disk. Mythology: In Greek Mythology, Cygnus has been identified with several different legendary swans. One story describes Zeus disguised as a swan to seduce Leda, the mother of Helen of Troy. Another story tells that Orpheus was transformed into a swan after his death and placed in the sky near is harp (the conste llation Lyra). 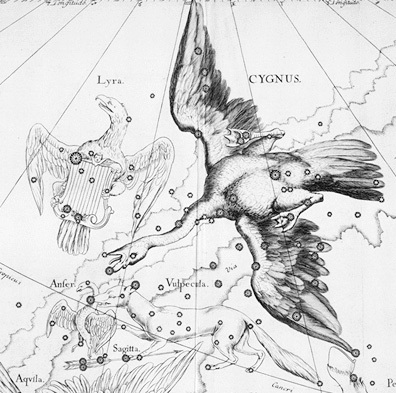 Cygnus is also known as the Northern Cross because of it's distinctive shape. The tail of the swan is marked by the bright star Deneb, Arabic for "tail". Three fainter stars cross the line between Deneb and the head of the swan, Albireo. 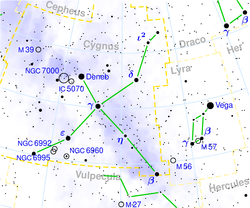 Cygnus flies southward along the summer Milky Way, and into the Summer Triangle. The Summer Triangle is made from the three brightest stars in the summer sky (Deneb in the constellation Cygnus, Vega in the constellation Lyra, and Altair in the constellation Aquila). Mythology: The most famous of the myths about Pegasus identifies it as the winged horse. Neptune, who loved Medusa when she was young and pretty, created Pegasus from white beach sand, rainbow-colored foam of breaking waves, and drops of blood from the severed head of Medusa. 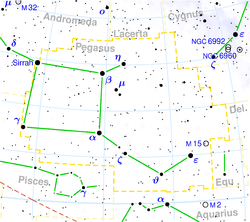 The four brightest stars in the constellation are known as the “Great Square of Pegasus”, which is thought to represent the wing of the horse. Mythology: King Cepheus and Queen Cassiopeia had a daughter named Andromeda. Queen Cassiopeia was a woman who loved to boast about her beauty. She even boasted that she was far more beautiful than King Neptune’s maidens. When the maidens found out, they demanded Neptune punish her. Neptune sent the sea monster, Cetus, to terrify all who lived along the coast of the country ruled by King Cepheus and Queen Cassiopeia. The sea monster created chaos in the country. No knowing what to do, King Cepheus visited an oracle to find out how he could rid his kingdom of this horrible monster. The oracle told Cepheus to sacrifice his only daughter so that way the maidens would feel they had been avenged for the way Cassiopeia had insulted them. Andromeda was stretched out at full length and chained by her ankles and wrists to a rocky island as a sacrifice to the sea monster named Cetus. Cetus had the forked tail of a dolphin, paws of an animal, head of a greyhound with short tusks, and a long, scaly neck. Cetus was said to be 40 feet in length, with ribs six feet long. The story continues with Perseus...(see December). Mythology: Perseus was known for two courageous acts. His first was getting the head of Medusa, who had snakes for hair and was so ugly that anyone who looked into her eyes turned to stone. Armed with a highly polished shield, winged sandals, magic pouch, and helmet, Perseus set off to slay Medusa. With the winged sandals and helmet that made him invisible, Perseus was able to sneak up on Medusa. He was able to slay Medusa by using the shield as a mirror to watch Medusa’s reflection without looking into her eyes. After killing her, Perseus scooped up the head and tucked it in the pouch, careful not to look at it. With the drops of blood from Medusa’s head, Neptune created Pegasus (see October). Perseus mounted Pegasus and flew away. As he neared his home, Perseus noticed a crowd of people gathered on a beach, so he guided Pegasus to see what the crowd was watching. The terrible sea monster, Cetus, was about to devour the beautiful princess, Andromeda, chained to a rock (see November). Perseus ran to put himself between the monster and Andromeda. He shouted for Andromeda to cover her eyes as he pulled the head of Medusa from his pouch for the monster to see. Cetus looked into Medusa’s eyes and instantly turned into stone. In his second courageous act, Perseus saved Andromeda and they fell in love. The pair can be seen together in the night sky. Sign up here for regular email updates from the Planetarium.